These units are modular, allowing for custom configurations of underbar equipment using standard components. Stainless steel all-welded construction. 12", 18, or 24" side-to-side. Available with flatboard top, recessed workboard top featuring removable stainless steel perforated insert with 1 1/2" stainless steel drain, or open top. 24" long units designed to accommodate nominal 20" x 20" full-size glass racks. All units feature 1 1/2" I.P.S. stainless steel drain on bottom. Heavy duty galvanized legs. Adjustable plastic bullet feet. FBGR12-22 24" x 12" flatboard top - 2200 series glass rack storage unit. FBGR18-22 24" x 18" flatboard top - 2200 series glass rack storage unit. FBGR24-22 24" x 24" flatboard top - 2200 series glass rack storage unit. GR12-22 23 1/2" x 12" open top - 2200 series glass rack storage unit. GR18-22 23 1/2" x 18" open top - 2200 series glass rack storage unit. GR24-22 23 1/2" x 24" open top - 2200 series glass rack storage unit. WBGR12-22 24" x 12" recessed worktop - 2200 series glass rack storage unit. WBGR18-22 24" x 18" recessed worktop - 2200 series glass rack storage unit. 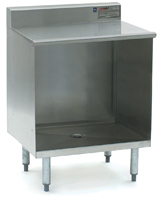 WBGR24-22 24" x 24" recessed worktop - 2200 series glass rack storage unit.